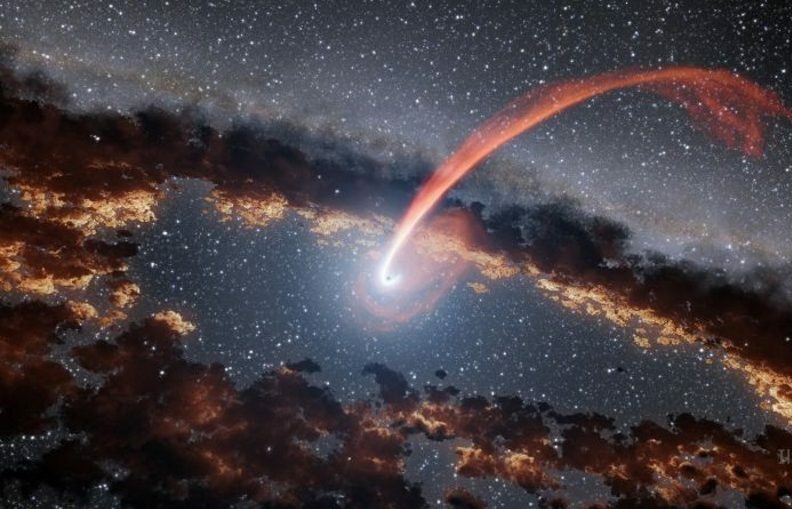 What happens when a dead star meets a black hole? The answer appears to be a brief zombie awakening, according to a new paper. Let me explain. A team of scientists was interested in how white dwarfs—small, dense objects thought to form when bigger stars run out of fuel—interact around black holes weighing between one and ten thousand times the mass of the Sun, also called intermediate-mass black holes. It turns out that, at least according to their calculations, these white dwarfs could reignite in a supernova-like explosion, generating heavier elements. Perhaps one day, physicists will be able to observe the results of these explosions. “Tidal disruptions of white dwarf stars by intermediate-mass black holes are complex and violent cosmic events capable of generating significant electromagnetic and potentially observable gravitational wave energies,” the authors write in the study accepted for publication in The Astrophysical Journal. The researchers built a physical simulation of these two objects passing by one another. They point out that these simulations rely on a whole lot of computing power, requiring an understanding of all of the moving matter, magnetism, radiation, and gravity in the system. “We do not consider magnetic fields or radiation in this work,” they write, but still include a full treatment of the effects of nuclear reactions as well as the black hole’s gravity including not just the simplest laws of physics drafted by Isaac Newton, but Albert Einstein’s theory of general relativity. Close approaches between these two objects would result in nuclear reactions on the white dwarf in all of the group’s calculations. The explosions were a lot like type Ia supernovae, the kinds caused by white dwarves sucking matter of off a heavier host and then experiencing an explosion on their surface. But in this case, the black hole’s intense gravitational pull on the white dwarf causes the explosions. These nuclear fusion events could lead to the production of heavier elements—specifically calcium or iron. Essentially, it would be as if the star was temporarily reignited. These interactions might also lead to bursts of gravitational waves that future experiments, like the LISA spacecrafts, could detect—but the signals would be rare. “Although these signals fall within LISA’s frequency band, the amplitudes are sufficiently small that they will not likely be observed except at source distances within [around 33,000 to 333,000 light years], which, if current estimates of the [white dwarf to intermediate-mass black hole] disruption rate… are correct, would be extremely rare events,” the authors write in the paper. It’s a very nice piece of research, K.E. Saavik Ford, Professor at CUNY Borough of Manhattan Comm. College and Research Associate at the American Museum of Natural History, told Gizmodo in an email. “This is a potential explanation for an unusual type of ‘transient’ or temporary source—one that appears and then disappears—which contains substantial amounts of calcium, but not so much iron or nickel, as we might expect in a ‘typical’ white dwarf generated supernova (Type Ia supernovae),” she wrote. Those supernovae generate lots of iron, but sometimes astronomers see events with less iron and more calcium. Perhaps these white dwarf-black hole meetings are causing those events. But Ford noted that there could be other ways to produce “calcium-rich transients” that scientists haven’t thought of yet. She also mentioned that “the simulation terminates just a couple of seconds after the most violent moment, while we observe supernovae over the course of months.” What would actually happen might be more complicated than what the study predicts, she said. Yet the study might also offer another way to potentially spot intermediate-mass black holes. As we’ve written, there’s compelling evidence, but nothing that’s really a knockout, pointing to whether these intermediate black holes, those more massive than a really heavy star and lighter than the supermassive black holes at the center of galaxies, really exist. The Swift telescope may have already spotted an interaction between an intermediate-mass black hole and a white dwarf in the form of a gamma-ray burst called GRB060218. In other words, we might be able to see these zombie awakenings from our planet.